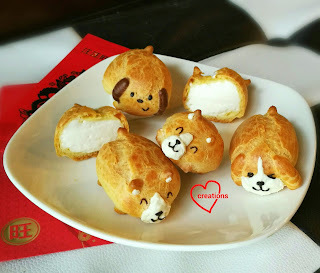 I have been wanting to make another doggy bake in time for Chinese New Year and contemplated making cute doggy buns. But inspiration strikes in another way and I came up with doggy Choux pastry instead. It's been a few years since I made famcy shaped Choux pastry and I have been contemplating playing with them again at some point because they have potential to be creative with. 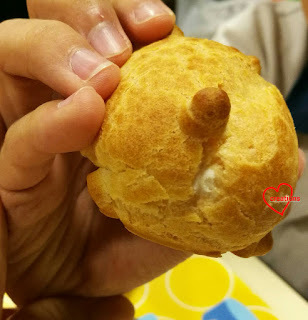 Presenting my humble attempt at making doggy cream puffs! My younger kid who is a fan of cream puffs really loved this and said I should sell them and make some for his teachers because they taste really good. (Not making for his teachers because I am not sure they will survive the heat and a kid's rough handling 😆). He wiped out almost the whole batch of cream puffs, restraining himself only because he couldn't bear to finish them all! Choux pastry recipes are more or less standard. The key is still in the technique of making sure the batter consistency is right and baking conditions. I adapted my recipe from here. The only modification I made was to use half bread flour and half plain flour instead of only bread flour. Some recipes call for a little bread flour or none at all. I chose to go somewhere in between. Bread flour helps to make the pastry crispier but the lower protein plain flour helps it to be more tender. 1. Sift flours and set aside in a bowl. Preheat oven to 180℃ and set oven rack to middle position. Use an oven thermometer at all times if possible as actual temperature may be different from oven setting. 2. Place water, milk, butter, salt and sugar in saucepan. Bring to a boil while stirring constantly. Once it reaches a roiling boil, pour mixture into the flour. 5. Transfer to piping bag fitted with a 2-2.5cm round tip. Pipe logs of about 5cm in length. If you don't have a 2cm piping tip like me, you may use round cookie cutters or even jumbo straws and stick to piping bag or ziplock bag :). 6. You may add a little cocoa powder to a small portion of batter to colour it dark brown for the ears. Transfer a little plain batter into piping bag with a small hole cut. Pipe the legs, tail, ears and snout. Wet a finger with water to tap down any peaks that occur from piping, especially the small parts. This also prevents them from burning when baking. 8. Pierce the Choux pastry once out of the oven to release any steam inside. Cool completely on cooling rack before decorating and filling. Melt some dark and white compound chocolate with a bit of vegetable shortening to make the chocolate for decorating the pastry. If you are just coating the pastry, prepare dark chocolate ganache instead. 1. Place whipping cream and icing sugar in mixing bowl. Chill in fridge. 2. Scatter gelatin over water in a microwave safe bowl. Let the gelatin sit in water for a few minutes. Use the microwave to heat at medium power for 10 sec. Stir to dissolve the gelatin. 3. Add a tbs of cream and vanilla extract to the gelatin. Stir to mix well. Let it cool to room temperature. 4. 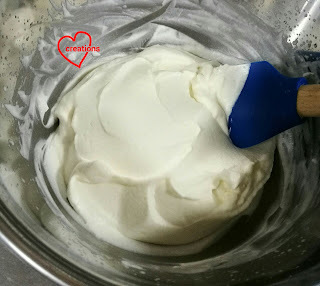 Use an electric mixer to beat the cream with sugar at low speed until it starts to thicken. Increase the speed a little and when soft peaks form, start adding the gelatin mixture gradually while whisking the cream by hand to incorporate. Continue beating the cream at low speed until firm peaks form. Be careful not to overbeat or it will separate. Choux pastries are best consumed freshly made. They are still good the next day. If you are particular about having them crisp, fill them only when you are about to consume. Baked unfilled pastries can be kept in airtight containers and toasted to make them crisp again. Unfortunately those decorated with compound chocolate cannot be toasted again or the chocolate will burn. I hope this gives you inspiration to try other creative doggy bakes other than doggy cookies and pineapple tarts that many people have been making for the year of the dog. I am sure it will delight your guests as well! Checkout some cute hedgehog cream puffs that I made at the same time as these doggies!